Nine Cache Hikers joined this late summer hike up Providence Canyon: Dave W., the leader, Dave P. Jane, Stephanie G., Terry, Deann, Gordon, Ryan and Joe. After carpooling from Logan, the group left the parking area at the mouth of Providence Canyon and started out about 8:35. We enjoyed relatively cool and shady hiking most of the way to the end of the "new" trail after 2.9 miles. We continued on a "user" path another 0.15 miles, then walked up the road to the top end of the quarry at mile 3.7. 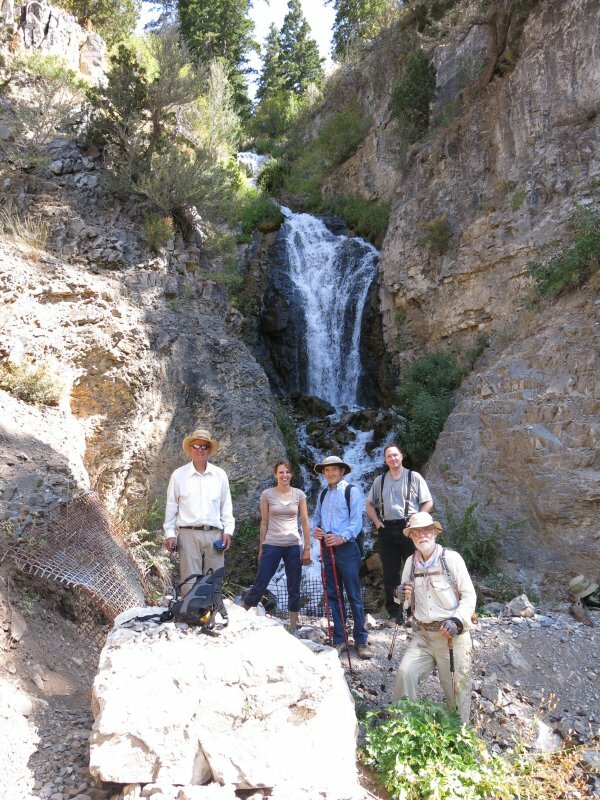 After eating our lunches, most of the hikers walked up to the waterfall and springs high above on the south side of the canyon, adding another 2/3 mile to the hike. Of course, the afternoon portion of our hike was warmer, but the shady trail made for pleasant walking. 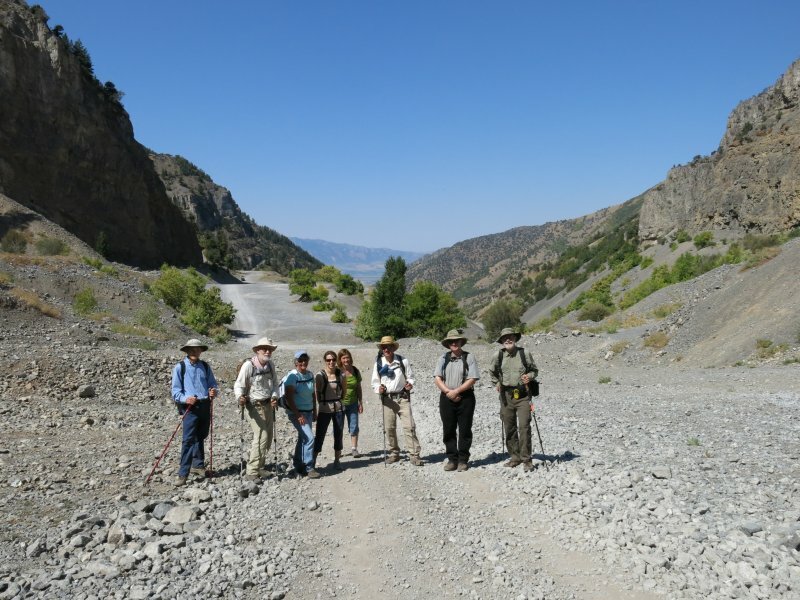 We encountered a number of mountain bike riders on the trail, and people were shooting guns at the quarry and along the road as we walked down the canyon. 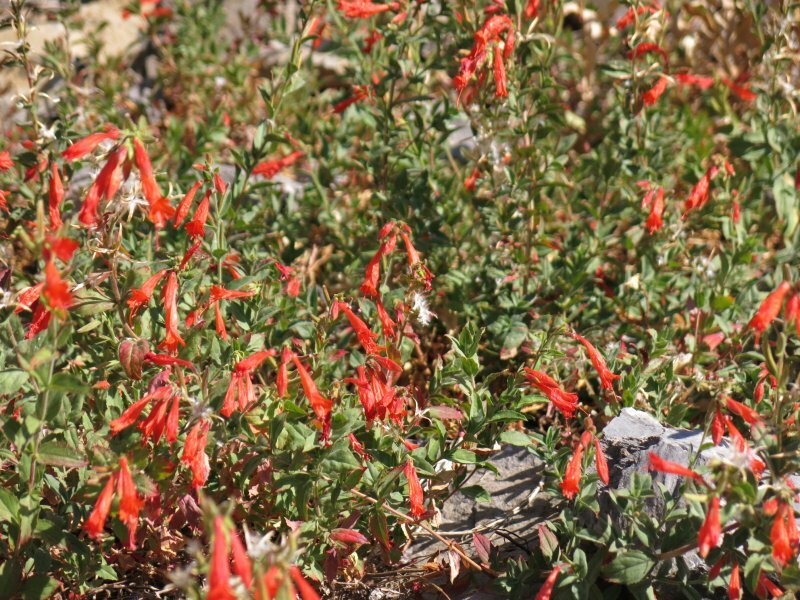 Most of the summer wildflowers are gone, but we saw hoary aster, showy goldeneye, and red Zauschneria near the spring. To our surprise, we also saw a black-and-white domestic rabbit about a mile from the bottom of the trail. Our hike totaled 8 miles and 1900 feet of climbing for those who went to the spring and 7.3 miles with 1650 feet for the others. We returned to Logan at 2:00. At the quarry (compare this with the photo from our March 2013 snowshoe trip). This is a topographic map showing our GPS track. You also can see our GPS track using Google Maps or Google Earth.